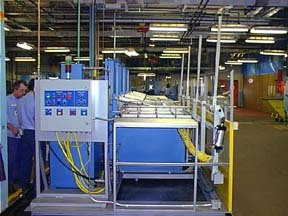 This fully automated wash/rinse/dry system was built in 1997 for a large automotive parts manufacturer. 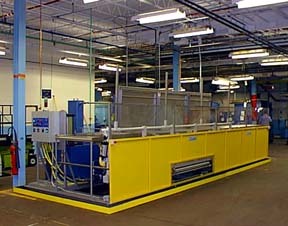 It is designed to thoroughly degrease multiple heat treating baskets loaded with components prior to heat treat. The system includes oil coalescing and decant units, super turbo filters and a hot air knife blow off for rapid drying without excessive heat. Each station can accept a 48″L x 36″W load weighing up to 1000 pounds. 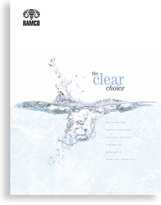 Automatic covers are included to reduce emissions and save on energy. Transfer is accomplished using Ramco’s patented Ram Tough articulating walking beam system with Automation Ready connectors. The controls include an operators control panel with an Allen-Bradley SLC500 for running the automation. Each station includes easy to use digital cycle timers and temperature controllers.